Ministry of Propaganda - 18/Dec/2006: "Sunday Afternoon in Bath"
If you were waiting for the weekly blog entry about my Sunday walk yesterday, my apologies, it got a bit later yesterday, too late to write the entry. Time to catch up today. In any case, I didn't really go for a walk this Sunday, but spent an afternoon in Bath, partly Christmas shopping, partly having a look around. 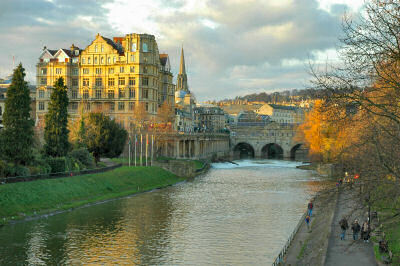 After arriving and parking near the cricket ground I walked over into the town centre, enjoying the view over to Pulteney Bridge on the way. The shopping was done quite quickly, I had one present to buy. But while I was in the shop I also noticed that they had The Pod in stock. I had thought about getting one for a while after seeing it on a blog somewhere (unfortunately can't remember where, so can't give the credit), now I decided to buy one. I also went into a book shop, leaving with Ian Rankin's latest, The Naming Of The Dead. That should be good reading for the Christmas holidays. With the shopping out of the way I went for a look around Bath in the last afternoon light. Past The Circus I walked to the Royal Crescent to try to take the pictures for a panorama. You can see one of the results above. Returning towards the town centre I decided it was time for a pint, looking for a nice pub I found The Raven. 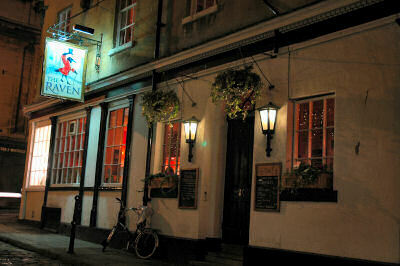 Very nice pub! I had a Raven's Gold, which is specially brewed for them only. Very nice real ale! Then I had to leave to drive back to Swindon after a very nice afternoon out. On returning home I spent some time on the phone (well, Skype to be precise) to speak first with my mother and then with a friend of mine on Islay. After a late dinner of smoked salmon (more about that on the IslayBlog soon) I went to bed. The blog entry and the weekends baking had to wait for another day. The Chocolate and Banana Muffins turned out very nice, I'm eating the first one while finishing this entry (another topic for an upcoming blog entry). And I hope you enjoyed this blog entry even though it is a day late. PS: I wonder what the Google Adsense ads will look like for this entry: Probably lots of baths (as in bathroom or bath tubs), but not much about Bath in North East Somerset.